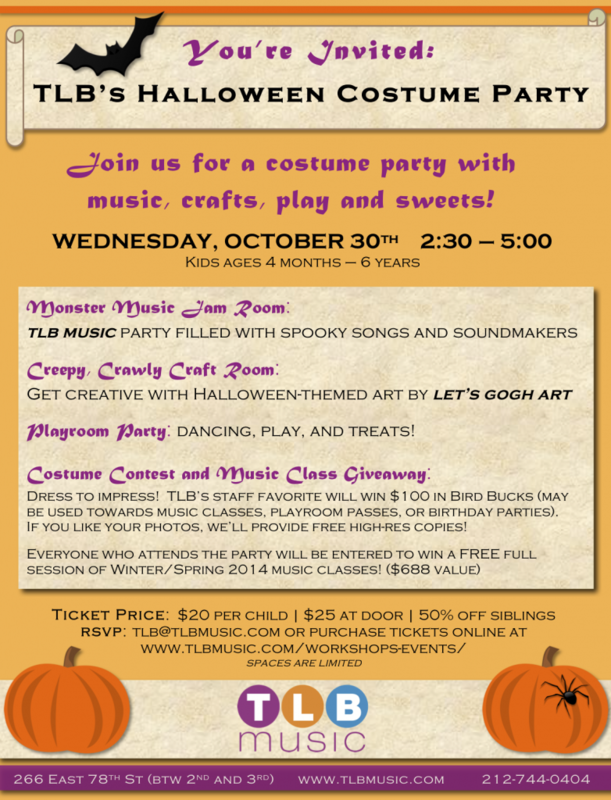 Katia and I are so excited to be throwing our first Halloween costume party for kids at TLB Music! We can’t wait to decorate the studio with cobwebs, spiders, glowing lights, pumpkins, and more. If you live in the NYC area, please join us on October 30th for music, making Halloween-themed crafts, playing in our indoor playspace, and snacking on yummy sweets. We’ll be giving away $100 in Bird Bucks to TLB’s staff pick for favorite costume of the day and will be raffling off a full session of music classes ($688 value) for our Winter/Spring 2014 session! Time: come anytime between 2:30 – 5:00! We think most people will stay about an hour.